Neil, an African American gay man living in the South, lost his job—and his health coverage—in 2010. That same year, he was diagnosed with HIV. He struggled for years without the medication he needs, which costs $3,000 a month and is not covered by public programs available in his home state. Neil is not alone. The Affordable Care Act makes numerous important changes to the U.S. health system, such as offering millions of people—including millions of LGBT people and their families—an unprecedented opportunity to access affordable, high-quality health insurance coverage, often for the first time in their lives. In order to better understand the degree to which the Affordable Care Act affects LGBT communities—particularly those who are potentially eligible either for Medicaid coverage or for financial assistance to purchase a plan through a health insurance marketplace—the Center for American Progress conducted research in 2013 that focused on the experiences of LGBT people with incomes less than 400 percent of the federal poverty level, or FPL. Among other findings, this research shows that one in three LGBT people with incomes less than 400 percent of the FPL were uninsured in 2013. The research survey was updated and refielded in summer 2014 to assess the law’s success in reaching LGBT people who most need help to get coverage. 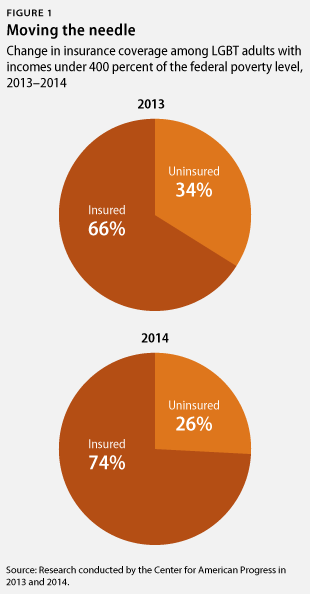 The findings were astounding: By 2014, uninsurance among LGBT people with incomes less than 400 percent of the FPL had dropped from the 2013 rate of one in three—34 percent—to one in four—26 percent—uninsured. In short, over the single year that encompassed the first open enrollment period under the Affordable Care Act, the rate of uninsurance among LGBT people fell 24 percent. Kellan E. Baker is a Senior Fellow with the LGBT Research and Communications Project at the Center for American Progress. Laura E. Durso is Director of the LGBT Research and Communications Project. Andrew Cray was a Policy Analyst with the LGBT Research and Communications Project.